The preteen wrote a letter to President Obama two years ago. An 11-year-old Massachusetts girl may have been the driving force behind the Treasury Department's move to put a woman on the $20 bill. Sofia wrote a letter to President Obama two years ago asking why there were not any women represented on U.S. paper currency, her mother Kim told ABC News today. "She came home from school one day and she said, 'Mom, I need to write to the president' so I gave her a piece of paper and that became the really famous letter," Kim recalled. "She really is just a regular, average, little girl who noticed something that was unfair and decided to do something about it." 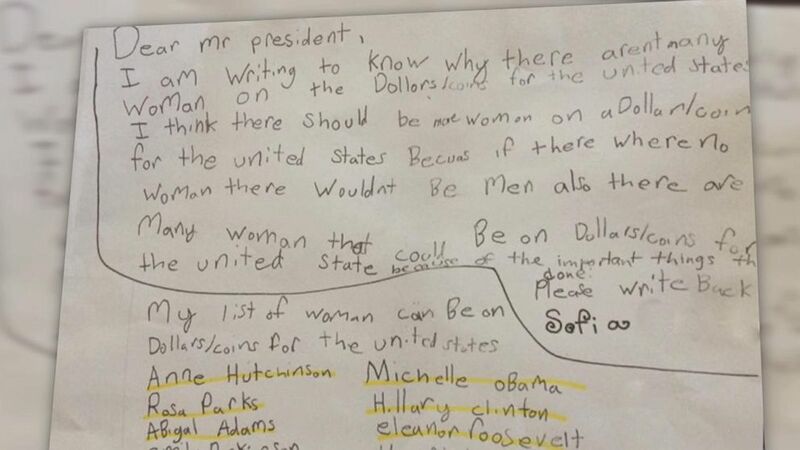 In the letter, Sofia, who was then a third grade student, makes a few compelling points for why a woman should be put on U.S. currency, including the astute observation that "if there were no women there wouldn't be men." (WCVB) A young girl from Cambridge, Mass. wrote to President Obama two years ago asking for a woman to be put on American paper currency, and on her 11th birthday her wish came true. The precocious preteen also included a list of potential female candidates. Harriet Tubman was on her list. On Wednesday she got a call from Treasury Sec. Jack Lew who told her directly that Harriet Tubman will be put on the $20 bill, according to Kim. Sofia also had a long phone call with President Obama's senior adviser Valerie Jarrett, who tweeted Sofia's letter.